E. Crispolti, Fontana. Catalogo ragionato di sculture, dipinti, ambientazioni, Milan:, 2006, vol II, p. 890, n. 68 T 122. St. Moritz, Robilant+Voena, Calder, Fontana, Morandi, 9 February - 9 March 2019. Fontana began to apply his famous slashes to the canvas in 1958 by means of sharp razor cuts. This Concetto Spaziale, Attese is among Fontana’s highly acclaimed works which would henceforth make history. Today they are among the highlights of numerous renowned collections, such as the Peggy Guggenheim Collection, Venice, the MoMA, New York, the Neue Nationalgalerie Berlin and the Pinakothek der Moderne, Munich. 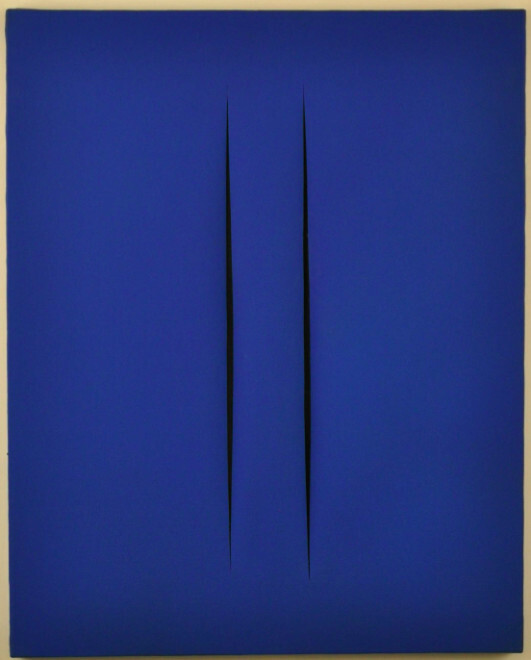 For Fontana, in his tagli (slashes), the important element was the space that he created within the framework of the canvas by cutting it open. This was the cosmos in microcosm, a sliver of the void and of the immaterial enshrouded within the bold canvas. As such, it is unbreakable, eternal. Those brief moments of creation with which Fontana slit the picture surface open are immortalised and therefore irrevocable. The vibrant blue of the canvas emphasises the material dimension of the picture due to its block colour devoid of hue, shade or tone, it draws the viewer’s eye towards the slash at the centre of the canvas. The artist brought the three-dimensionality of the picture, the fact that it is not a mere surface but instead an object in its own right, to the fore. Through the gaping cut into the monochrome work, Fontana broke through the constraints of the canvas, beyond the surface and into the depth of the painting itself. The impression of spatial extension occurs not only at the edge of the work, but also in the opened canvas, through which the viewer's eye explores the mysterious depth of the seemingly infinite space, making it a meditative space, which, as Fontana's added phrase Attesa hints at, has the potential to evolve further. By the time that Fontana began painting his Attese, he had already used monochromes, often manipulating their surfaces by way of a range of interventions. In the 'slashes' such as Concetto spaziale, Attese, though, there is often a uniformity, as for these works the artist used water-based paint which allowed the texture of the canvas to come through. The paint itself is a thin layer of blue, insubstantial except in its visual impact, unlike the more tangible oil paint used in some of his other series. 'My art is entirely characterized by this purity, by the philosophy of nothingness, which is not the nothingness of destruction but the nothingness of creation [.] And the very slash[.] was not intended as a means of destruction of the image, on contrary, it served as a means to explore what lies beyond it'. (Bettina Ruhrberg, ‘Kritisches Lexikon der Gegenwartskunst’, Munich 1993, p. 3). Please note that the price and availability of the above work are subject to changes without prior notice. Where applicable ARR will be added.